The Aristo RS-3 is a fine engine. It pulls well, runs smoothly and is very well detailed. However, even a well implemented engine could use some work. This page describes changes I have made to the headlights, sound system, the addition of DCC (twice) and modifications to the smoke system (also twice). The RS-3 was made by Alco starting in 1950. It is a 1600 hp locomotive powered by Alco's noisy and smoky but otherwise competent 4 stroke diesel engine. Most roads ran the RS-3 long hood forward in switcher and steam engine tradition. Santa Fe ran the RS-3 and its cousins such as the C-C RSD-5, short hood forward. I found a page at the ATSF All Time Diesel Roster that indicates that the ATSF owned exactly one RS-3. Gregg Fuhriman who manages the page writes: "The RS-3 was originally built as a demonstrator unit by Alco ... it had a carbody like an RS-2 but was mechanically an RS-3. Santa Fe numbered it 2110 after it was acquired from TP&W in Oct. 1950, and painted in the black/silver zebra stripe scheme. Then it was renumbered 2099 in May 1952. Some time later it was repainted in the blue/yellow trim scheme. It was retired in 1969." A dimensioned drawing of Santa Fe 2099 can be found at Santa Fe Locomotive Drawings under diesel Class 2099. The model, also numbered 2099, is nominally 1:29 scale and scales out pretty close. The real 2099 had a steam generator and its exhaust stack would be where horn on the short hood horn is. Overall, the model has good detail and runs very smoothly and quietly. There are at least four production versions of the Aristo RS-3. The first two of which I refer to as the "old" and "new" style. Aristo made significant changes to the internal structure between the first two. Externally they are identical. A third version (which I have not seen) has a redesigned power brick with ball bearings on all axles so that the engines tolerate increased weight better. A fourth version has also been released. This one has significantly increased weight already installed, a new smoke generator, and new internal wiring to accept a DCC decoder or R/C receiver. The fan grill is an etched metal piece and the handrails have been reformed. The RS-3 uses yellow LED's to represent headlights. These can be seen in daylight, but do not cast any kind of a beam so that at night, the effect is pretty poor. I deemed this something that had to be fixed. The lights of the old style RS-3 can be changed out to incandescent bulbs that produce a much better effect, especially at night. I used Radio Shack 272-1092c Grain Of Wheat bulbs to replace the LEDs. These are 12 volt 60 mA bulbs and fit in the existing holes in the hoods. I initially wired them in series like the LEDs and replaced the current limiting resistor with a diode to allow directional lighting. They weren't bright enough to suit me. Instead, I hacked up the board and wired them essentially in parallel with a 100 ohm resistor in series with each bulb. This allows each bulb to draw just over 60 mA at full track voltage (about 20 volts) and they burn brightly. Use a separate resistor in series with each bulb so that if one bulb fails, the voltage on the other bulb will not increase. The capacitor is optional, if you use Aristo PWC, you'll get brighter headlights at low speed than without it. If you don't have PWC, then you might need to decrease the resistor value to 47 ohms. The stock LED's are wired in series with a current limiting resistor. LED's are diodes, so that directional lighting is automatic. The new series diode provides the directionality in this circuit. If the lights do not come in the right direction, reverse the lighting wires to the circuit. Aristo mounts the boards that hold the LED's and the resistor with a wad of hot glue. On mine, the glue flowed around the LEDs and glued them directly to the hood. When I pried off the board, the LED's were ripped apart. This is not a problem as they will be discarded anyway. Lighting on the "new" model RS-3 is fed from a constant voltage regulator mounted in the switch board. The schematic is shown near the bottom of this page in the DCC section. These LEDs can be changed out to 1.5 volt GOW bulbs but they will burn too dim unless the 330 ohm resistor (located on the switch board) is reduced in value. You will have to determine the proper value for this resistor based in the current draw of the bulbs that you use. I would start out at about 100 ohms as a first guess. I didn't actually make the modification this way as I power 12 volt bulbs from a DCC decoder. The RS-3 comes with the standard Aristo AAR type knuckle coupler. See Large Scale Coupler Tips for more information on this coupler and alternate types. This mount is somewhat different from other Aristo couplers. The mounting configuration for the stock coupler gave me a little trouble. The centering spring is a piece of piano wire that fits in a groove on the bottom of the coupler body. The spring arrangement gave me some grief as the spring would pop out of its groove and back in when entering and exiting curves. The snap sound was quite audible. I attached a piece of styrene over the top of the groove with CA (super glue) to keep the spring in the groove. You can't just glue the spring down as it needs to slide in the groove. The form of the spring may also need minor modification so that it doesn't rub on the coupler mount screw head. If you need to, you can make replacement springs from 0.032" music wire. Newer production RS-3's have this spring capture feature added to the coupler. The spring has also been bent so that it clears the coupler mount screw head. The old spring would sometimes rub on the screw and either not center properly or pop out of the groove. I've never tried to install a hook and loop coupler on an RS-3, but rumors abound that it is a difficult job requiring some cutting of the pilots. The loco is fairly long and there is a large overhang at both ends that prevents the knuckle couplers from working on 2' radius curves. The couplers just move sideways too much in turns and they will drag the following car off the track. Installing Kadee's doesn't help this. It may be possible to get the couplers to work on 2' radius curves but at the very least, the coupler swing would have to be significantly increased by cutting on the pilot. Some work on the centering spring may be required as well. I initially mounted Kadee "G" scale couplers on the RS-3 using Kadee's instructions. The upside of this approach is that its a no-brainer and it works. One downside is that you have to buy TWO coupler kits, one for the medium offset couplers, and one for the special pockets. You end up with the parts for a Kadee #837 kit left over. Another downside is that the coupler box sticks out from the engine pilot further that I would like. Later, I found that a #831 pocket could be modified to fit with the medium offset coupler from the #836 kit but you still end up with the parts for a #837 kit left over. To make the Kadee recommended modification you need a #832 and #836 (or #1832 and #1836 for #1 scale couplers). Detailed instruction for mounting is given by Kadee at their RS-3 Conversion page. My revised method mounts the coupler 1/4" closer to the loco body. Only half of the box sticks out versus the whole box. Drill out the mounting hole on a #831 pocket to 1/4" and drill the small hole in the back of the pocket as shown in Kadee's instructions. Use the medium offset coupler from a #836 kit. You also need to file down the two ridges on the sides of the mounting post slightly so that they don't bind on the pocket. The centering spring will also have to be shortened. You can cut the old one to fit or bend yourself a new one out of 0.032" music wire. The coupler height will be a little sloppy with this method. I found that the centering spring can usually be adjusted to set the coupler at the right height. If that doesn't work, cement one or two of the black shims supplied in the Kadee kits to the pilot right under the coupler box to prevent it from dropping too low. Either of these conversions works fine on 4' radius track, but they do not work at all on 2' radius track. The coupler swing is too limited and the engine WILL derail the following car. 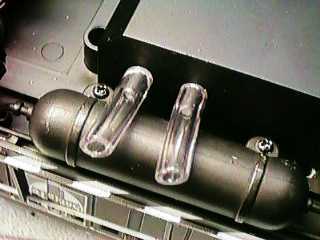 The couplers on the RS-3 mount on plastic posts. If you run a multiunit lashup, you can pull a long string of cars and all that force will be applied to the coupler post on the last engine. I've not broken one yet, but I've seen them flex. I have reinforced mine with a wad of plumbers epoxy putty to shore up the post so that I don't snap one off at the base. There is also a derailment issue with either coupler of the RS-3 pulling a car with truck mounted couplers over turnouts in one particular track geometry. This case is pretty obscure, but it happened to me twice requiring some minor trackwork changes. When the RS-3 runs through the straight path facing point over an LGB 1600 turnout, AND the track curves away from the curved path immediately following the turnout, a derailment will happen nearly every time. As the engine passes the turnout and enters the following curve section, its rear coupler swings the other way. This pushes the coupler on the following car sideways just as the first wheel of the car is running through the frog and the wheel will usually slip sideways and hit the point of the frog dead on and derail. The only fix for this problem is to add at least 6" of straight track (more is better) between the turnout and the following curve. 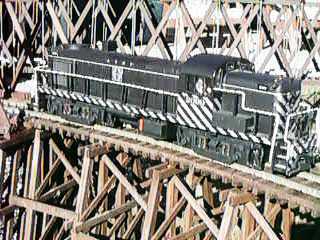 Actually, this problem is not unique to the RS-3, it will happen on any loco with body mounted couplers and limited coupler swing. Aristo has released a sound system for the RS-3, the ART-29338. This is a digital sound system manufactured for Aristo by PH Hobbies. There are apparently three versions out already, mine was the second version. The unit is mounted in a replacement fuel tank. The speaker comes with the RS-3 and is mounted under a grill on the top of the long hood. The installation instructions provided by Aristo were typically cryptic. The system provides a recorded Alco diesel sound, an air horn, a bell, and "cab chatter" which is a short radio conversation between the engineer and a tower. At startup, there is an engine startup sound and a revving engine. On slow down, the brakes screech and the sound drops to a typically clanky Alco idle. 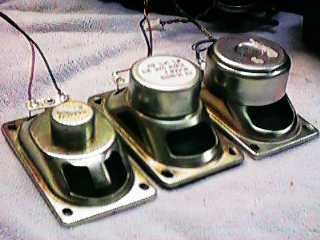 Three separate reed switches and magnets are provided to trip the horn, bell and cab chatter. All these sounds will play from the stock speaker. Older models of the RS-3 used a speaker with a lower power rating than the sound system so if you play it loud, the speaker will overload. A high quality replacement speaker is available from Aristo. Newer engines come with the better speaker than the original one, but not as good as the optional speaker. There is also an option in the sound system to add a second speaker and to split the sounds between the speakers. There are two audio amplifiers and two volume controls, one for the engine sound and cab chatter and one for the horn and bell. However, it isn't necessary to add the second speaker unless you like to play your sounds really loud. The second amplifier and speaker allows the horn or bell to play without saturating the engine sound amplifier if you have the volume turned way up. The second speaker could be mounted in the rear of the long hood, but the fan assembly needs to be removed to make room for it. This will essentially disable the smoke system. There is a battery to allow the sound to play at low track voltage. It is rather small and if the engine is left at idle for a half an hour or so, the battery will discharge and will require recharging which takes 10 hours or so. PWC will help keep the battery charged under extended periods of low engine speed. Even PWC will not help as much as it could because there is a large inductor in series with the power input to the unit which filters off most of the shorter PWC pulses. The inductor is there to protect the system from high voltage pulses from some pulsed power packs. This inductor can be shorted out and the circuit will charge better from PWC pulses, but modifying the sound system this way will likely void the warranty. PH Hobbies has recognized this problem and for $10 they'll send you a "booster circuit" which is what is shown in this schematic. The circuit is also available from Aristo. Its basically an accessory battery charger that doesn't have the inductor in series. This circuit can be used in two ways. It can be hooked to the track and if you use PWC, it'll generate enough output to charge the battery at lower track voltage so that you can run the engine slowly and not dump the battery. Without PWC it won't do anything more than the internal charger. Alternately, you can hook it to an external connector and supply either DC or AC power of 10 to 12 volts and the battery will charge without the engine or the sound system running. The accessory charger will allow the unit to charge better from PWC that it will by itself (this is due to the inductor). These three curves show the relationship between the track voltage and the battery voltage for three cases, using an Aristo 5400 power pack, a 5471 Train Engineer and a pure DC power supply. In all cases, the engine starts to crawl with about 1.7 volts average on the track, but the PWC power packs cause the battery voltage to increase, indicating that it is either getting some charge or at least getting some help, at lower track voltages than with a DC supply. The no load voltage of the battery is about 6.3 to 6.4 volts depending on if it has seen some recent charging. Any battery voltage above this no load voltage indicates that current is flowing into the battery and the battery is being charged. Voltages less than that indicating that the battery is discharging. Installation of the sound unit in the "old" RS-3 is fairly straightforward, it plugs right into the locomotive and speaker. 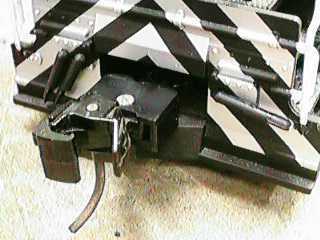 The bell and horn reed switches, if used, can be mounted to the rear truck, one to the right and one to the left of the front of the rear power brick. The cab chatter switch is up to you, Aristo recommends mounting it on the side so that it can be triggered by a sign mounted magnet. I didn't use it. 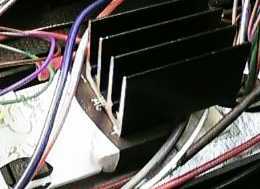 The sound system plugs into the little distribution board inside the long hood to pick up power. The way that Aristo has wired the RS-3, the sound system runs off the lighting circuit so that the lights must be on for the system to work. This is OK because it provides an easy way to shut the system off if desired. Both the bell and horn have an "automatic" or "manual" mode which are selected by jumpers on the board. Automatic mode is for use with magnetic triggers so that a short trigger will play a preprogrammed sequence of either the horn or bell. If you use a different control mechanism, like an ART-5474, then the manual mode will play the sound for as long as the trigger is present. A drawback of the manual mode is that the minimum horn duration is about 1 second which makes it hard to create some common horn signals, such as a grade crossing signal, which requires short horn blasts. Paul Housey at PH Hobbies tells me that they couldn't make it any shorter without getting a click in the sound so they are going to record more horns and try to get a recording that can be shortened. I had some difficulty during installation, I managed somehow to "crash" the sound system. It was stuck in the "on" state, but it didn't make any sounds (other than picking up a local radio station when I touched the J4 jumper). I had to remove the power and unplug the battery to "reboot" the system and it started to play again. I also got it into this state a couple of other times for no obvious reason. Don't assume that the sound system has failed if it stops working. Either let it sit for awhile (it will flatten its own battery and reset) or momentarily unplug the battery and it may recover. Other users of the RS-3 sound system have reported the same difficulty. This is clearly a problem that PH needs to address. I installed an ART-5474 to control the bell and whistle. It wouldn't fit with its case so the bare board is installed on the back of the speaker with a piece of foam mounting tape. The power connector wouldn't fit well either so power is wired directly from the 5474 PWB to the back of the switch board lighting circuit. The small power distribution board was also moved forward about a half inch to clear the 5474. This 5474 has a separate antenna wire as described in 5474 Tips. I also mounted the accessory charger next to the distribution board as there wasn't enough room for it under the 5474 when the upgraded speaker is used. Eventually, I might hack together an adapter to allow the cab chatter to be triggered off the 5474 as well, for now the reed switch has been unplugged. I am still suffering some range difficulties with the 5474 mounted in the RS-3. This is frustrating because it seems to work OK when the engine is sitting on my bench. When its on the track, the range is maybe 20' maximum. I suspect that the proximity of the antenna to the ground is part of the problem. I did find that for some reason, the 5474 was sensitive to something in the RS-3 wiring. If I ran the 5474 from a bench supply it would work fine. If I ran it from a PWC source separate from the one that was running the engine, it also worked fine. When I connected it to the engine, it would hardly work at all. I found by experiment that if I installed two RF chokes (ones that came with a 5490) in the power leads of the 5474, it started to behave while on the bench. Since the motors were turned off during all this work, I have no clue as to what the problem is. If you do install another type of controller for any PH Hobbies sound system, you can pull the wires to the reed switches entirely out of the connector (after pulling the connector from the sound board). Then just press the new wires back into the connector where the old ones were. That way you can get rid of the overly stiff wires that come with the reed switches. Aristo offers an upgraded speaker for $12.50 + $3 S&H (right one in the photo) for the RS-3 as the digital sound system can really overpower the existing speaker if the sound is run fairly loud. The stock speaker (left one in the photo) is good enough if you run the sound at low to medium volume. The center speaker is one that a friend of mine found at a computer swap meet for $1. This one sounds just as good as the upgraded speaker but it doesn't have the water resistant cover that the upgraded speaker has. It would seem that this speaker size is commonly used in personal computers so if you look around you should be able to find a better speaker for less money than Aristo charges. I understand that the later production runs of the RS-3 have a better speaker than the original one, but not as good as the optional upgraded speaker. I would guess that the improved speaker is probably good enough. The volume controls on the sound system are nearly inaccessible. My system came with two small white shafts that couldn't be turned once the fuel tank is installed because there is an air tank in the way. I understand that these shafts have been changed during the sound system production so yours might be different. The shafts can be pulled out of the volume controls. I extended the shafts with some 1/8" vinyl tubing so that I could reach them. The tubing was just a little too large to fit over the shafts snugly, so I slipped a short piece of 3/32" shrink tubing over the shafts (a tight fit) and then the vinyl tubing fit snugly. I can now reach the volume controls while the loco is sitting on the track. My RS-3 suffered from too much wheel slip when it was new so I added 2 lbs of lead to the engine. With the extra weight, it will pull as well as the best of them. After the engine got older and the wheels scuffed up some, tractive effort improved and perhaps I could remove some of the weight. I added two 8 oz sinkers by epoxying them to the inside of the short hood. There is less room above the truck in the long hood due to the circuit boards, wiring and smoke unit assembly. I used 1 and 2 oz weights under and inside the fan plenum to total another 16 oz at the rear. If you really want to go overboard, you can attach another 16 oz to the inside of the long hood just forward of the fan plenum box. Some very early production RS-3's (mine for example) had a problem with the fan when run from Aristo's PWC power packs. The fan wouldn't even start to turn until the engine got going pretty fast. The fan pumps air into a "fan plenum" box that feeds the smoke unit so that the RS-3 can pump out a fair amount of smoke. The problem was that the fan motor rejects the PWC pulses just the same way that a drive motor does. The solution is to filter the power to the whole smoke circuit. If you use PWC, the smoke generator and fan will pump out visible smoke just as the engine starts to crawl. The fan and smoke unit run off a bridge rectifier. The diodes are mounted on the board with the switches. There is a fifth diode on the board wired in series with the smoke generator. This diode is forward biased by the DC current coming from the bridge rectifier. The 1 volt or so fan motor is wired across this diode so that the smoke generator draws all its current through the motor until the voltage across the motor reaches 0.7 volts and then the excess current is shunted by the diode. This allows the fan motor to reach full speed at fairly low engine speed and then stay at that speed regardless of engine speed. The problem is that the pulses of the PWC energy are rejected by the inductance of the fan motor and it didn't run well at all. The fix is to add a 50 micro farad filter capacitor at the output of the bridge rectifier. With PWC this provides an average output voltage that is much higher that it would be if the capacitor was not there. This allows the smoke generator to work better at slower speeds. After this modification is made, the fan will run fine on either DC or PWC. With PWC, the smoke unit will run better at lower engine speeds than it did before. Jim Fodor writes: "I just discovered an improvement to the RS-3 smoke unit. I removed the fan grill while the smoke unit and fan were operating and noticed the smoke came out more 'forceful' and more realistic looking. Apparently the grill is not allowing free flow of air through it. I used a small drill (# 60 I think) and drilled out the paint "globs" in each grill opening allowing better air flow." I'll be dipped if he isn't right. Drilling out the holes in the fan grill results in a significant improvement in smoke generation. Another impact is the screen on the exhaust stack. It sometimes gets clogged with liquid smoke fluid, especially just after smoke fluid is poured in. I simply poked out the entire screen with a small screwdriver and got a much more pronounced smoke flow. I'm not sure that there is more smoke, its just better directed so that it shows up better. The RS-3 is a well detailed engine and has a typically excellent Aristo paint job. However, the grab irons are unpainted brass wire mounted in unpainted brass eyelets. These look terrible. Not to worry, because these offending items are easily painted. The eyelets can be painted the same as the engine body color. 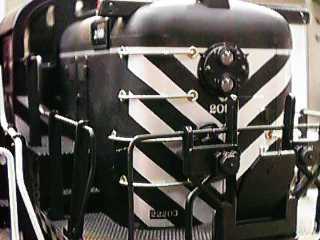 Even on the ATSF Zebra Stripe engine, where the stripes go right through the eyelets, can be painted so that eyelets are much less obvious. The grabs can be removed for painting or they can be painted in place. I chose to paint the grabs black. However I did paint the handrails white to add a little contrast. Late in 1997, Aristo changed the internals of the RS-3. These changes are not obvious from the outside, but they have a significant impact on sound unit installation and any other wiring changes. Since this change is obviously directed at more modular assembly, easier maintenance and easier upgrade installation, I am guessing that we may see similar changes to other Aristo locos in the future. The only obvious external indicator of a change is that a lip has been added to the switch cover so that the cover is much easier to remove. Another way to tell if your unit is a new one is to turn on the smoke and pull out the smoke generator. If the fan still runs, it is a newer unit. Disassembly is a little different as well as the entire shell assembly is semi permanently assembled in one piece so that the long hood, cab and short hood must be removed as a unit. The internal wiring harnesses have been replaced with a long circuit board that runs the full length of the frame. This board has connectors that protrude downward into the fuel tank for easy installation of a sound system. Older sound systems can be adapted to the new connectors with an adapter cable which is available free from Aristo. It should no longer be necessary to remove the hoods to add sound. The bricks also connect to this board with new connectors so that removal of a brick will not require removal of the shell. 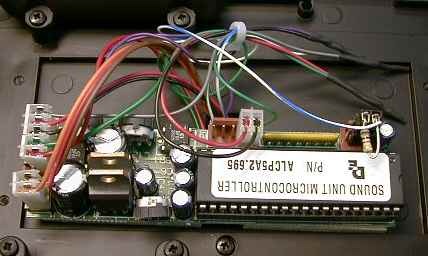 The long printed wiring board also has connectors (currently jumpered) installed that are configured to accept an as yet unannounced control receiver. The wiring diagram of the "new" RS-3 is shown below. This diagram was traced out from an early version of the "new" RS-3 and may or may not represent current production. In this loco, the 5 volt constant voltage regulator did not work properly. It has enough output to power the lights (about 180 mA) but not enough to run the smoke unit (another 500 mA). I do not know if Aristo has fixed this problem. In any event, when I did a DCC install in this loco, I "fixed" it myself by changing out the 5 volt switching converter that Aristo supplied to a 5 volt linear regulator. The upside is that the smoke now works, the downside is that the regulator gets REALLY hot when running on constant high track voltage like DCC. I had to bolt the regulator IC to the metal weight on the frame, and even then it gets too hot under extended running so I had to add a dropping resistor in series with the regulator. This works OK under DCC, but it takes 15 volts on the track to get the smoke and lights to full intensity. The changes to the regulator are shown in the "new" RS-3 DCC conversion schematic in the next section. DCC installation in the RS-3 is not too complicated, but there are some things to consider. Since a DCC decoder can control motors as well as lights, some of the switches on the top become unnecessary. You want your decoder to come alive when the engine hits the track, so the decoder should run from the power pickups and the motor will run from the decoder. The motor switch then becomes unused although you can wire the input power to the decoder through this switch if you want, but then the long hood will have to be plugged in to allow the engine to run. Bypassing the motor switch and allowing the engine to run without the long hood facilitates troubleshooting. Also, the headlights can be rewired to run from the decoder leaving the markers and cab lights connected to the track. The smoke circuit is unchanged. The sound system has to be connected to the motor circuit so that it can sense the motor voltage to control what engine sound is generated. This causes some other problems too, see below for details. A two motor large scale loco can draw a lot of current under load. It would be wise to use the largest available decoder. I initially used a Digitrax DG580L, 5 amp decoder. Even this one runs pretty hot. After extended running under a heavy load, it actually began to protect itself by shutting down. The train would just stop for about 3 seconds about once a minute. I bolted a small heat sink (Radio Shack 276-1368) to the bridge rectifier housing with a 4-40 screw. The decoder still runs pretty warm, but at least it does not shut down. Eventually, I found that the DG580L was not up to the job in the RS-3 (I toasted two of them) so I replaced it with an NCE D408 decoder. This one has given me minimal difficulties and it hardly runs warm. As a test, I also had a Lenz LE230 in one RS-3 for awhile. It also worked fine and it barely ran warm. Earlier I also had an Aristo 2.5 amp 5490 mini receiver in the RS-3. It also ran only slightly warm so that I suspect that the Digitrax DG580L isn't what it is claimed to be. The following diagram is a schematic of the old style RS-3 before modification. This diagram shows the location of the wires that you will need to locate to do a DCC installation in an old style RS-3. As with any DCC installation, the motors must be isolated from everything else. 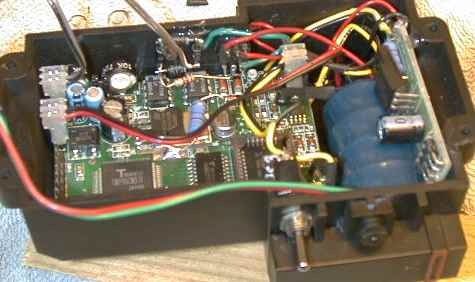 Since the wiring of my old style RS-3 has already been modified heavily to accommodate a 5490 that didn't work out, it already had the motors disconnected from the distribution board, isolated and paralleled with each other. It was an easy matter to hook these wires to the orange and gray wires of the decoder. I picked up power for the decoder from the underside of the little distribution board under the RS-3 long hood. Once this is done, the engine will run without the long hood plugged in. Since I didn't trim any of the decoder wires, the installation gets to be a little bit of a mess. However, its fairly easy to work on. The decoder is mounted on the weight directly under the speaker. On top of it is a little board with optical isolators that the sound system needs to isolate the horn, bell and cab chatter triggers. I left the front and rear markers and the cab light wired from track power as before but I ran the headlights from the F0 outputs of the decoder. This allows the directionality of the headlights to operate properly. I also wired a 150 ohm resistor between the front and rear headlight function leads. The effect of this is to cause the headlight facing in the direction of travel to run at full intensity, while the other one is dimmed. I originally tried to use the Rule 17 dimming FX generator in the decoder to do this, but it didn't work quite right. I only used one bulb, front and rear, for headlights. I wired the other bulb to other function leads to allow a Mars light simulation using another FX function generator. Since functions F5 and F6 can't be used with FX generators and F1 is the bell and F2 is the horn, this left F3 and F4 for the Mars lights. With the DG580L, if F4 is on, Rule 17 is invoked and the headlight is dimmed. I couldn't get a bright headlight and the rear Mars lamp to work at the same time so I decided to abandon the Rule 17 FX and deal with the dimming in hardware. The sound system is a special case in the RS-3. The power for the sound system must be derived from the motor so that it can know the speed of the engine so that the engine startup, rev up and rev down and brake squeal sounds will still work. If you just leave the sound system connected to the track, it'll go to full speed and stay there. 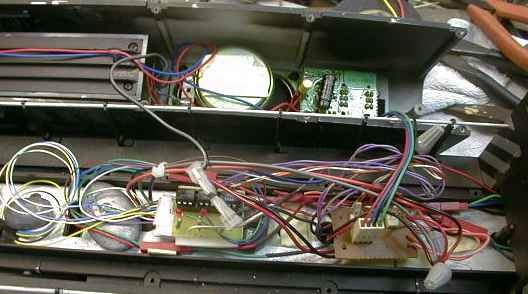 I initially removed the accessory battery charger as it was connected to the track and would result in a short between a motor lead and a track lead, a major no-no for a DCC installation. I had hoped that the pulsed power applied to the motor would result in sufficient charging of the sound system battery but it didn't. I began to have problems with the battery flattening. I had so much difficulty with the sound system hanging up due to the battery going nearly flat that I installed a sub-miniature toggle switch in the side of the fuel tank so that I could disconnect the battery to reset the sound system without removing the tank. I have since solved the battery charging problem as described below. Function outputs from the decoder are used to trigger the bell, horn and cab chatter. This works out fine, BUT you have to provide isolation between the decoder function outputs and the sound triggers. This could be done with reed relays or optical isolators. I choose to use 3 optical isolators. Most PWM type motor controllers require the motor leads to be isolated from all other wiring. This is true of DCC, the Aristo ART-5490 and most receivers designed for battery power. Since I wasn't getting enough average power from the DCC decoder to keep the battery charged while the whole sound system ran off the motor circuit, I elected to isolate the sound system from the motor and charge the battery off the track. This is the arrangement that I ended up with and it actually works out better than ever before. It also works better with PWC track power as the motor RPM sound is much better scaled to engine speed. The sound effects follow the engine speed smoothly from a dead stop to full speed. With linear track power, the sound system scales to engine speed reasonably well anyway so all this stuff is not really necessary. With linear track power, the battery will not charge properly at low speeds whether you make this modification or not. The motor power is rectified by a bridge rectifier and a 2.2K resistor is used to limit the current to the LED inside the optoisolator. With an unfiltered DCC decoder or with PWC, the signal coupled through the optoisolator is pulsed width modulated and the resistor value has little impact on the speed scaling. With linear power on the motor (linear track power or a DCC decoder that has a filter at its output) the value of this resistor determines at what motor voltage the sound system reaches full a RPM sound. If you would like the system to reach full RPM at lower speed, decrease this resistor to about 1K but you shouldn't go below 1K as you might dump too much current into the LED and burn it out. You may have to adjust this resistor if you use a different optoisolator than the NTE3041. The NTE3041 has about a 100% current transfer ratio, that is the phototransistor output current will be roughly equal to the LED current. The circuit may not work properly with an optoisolator with a CTR of less than 50%. You can also use a Darlington output optoisolator, but in that case, you'll probably have to increase R1 significantly due to the much higher current gain of the phototransistor. The PH Hobbies battery booster circuit is hooked to the track and provides full charging to the battery whenever the engine is sitting on DCC or PWC energized track. The booster circuit also provides +8 volts to bias the output transistor of the optoisolator. The RS-3 sound system reaches full RPM sound at about 7 volts input, so that when this phototransistor is fully turned on by the light coming from the LED, about 7.5 volts is applied to the power input terminals of the sound system. With the battery voltage at full, the power input terminals of the sound board draw very little current (up to about 10 mA) until the input voltage exceeds 8 volts. If the sound system were operated normally with the power terminals hooked to the track, the unit could draw over 200 mA while charging the battery, running the synthesizer, and powering the audio amplifiers. However, at less than 8 volts, all this extra current comes from the battery terminals instead. With only 8 volts input, the system may not generate quite as loud a sound without excessive distortion as when the input voltage is higher, but it is loud enough and at the volumes that I think are reasonable, the distortion is no higher than with 20 volts at the input. If you find that the 7808 regulator on the booster board runs too hot (if you can't touch it, its too hot) then insert a 40 or 50 ohm 1 watt resistor in series with one of the track leads. If you run DCC at 20 volts or so, the regulator would have to absorb 12 volts at full current. The resistor will take about half of the stress off the regulator and still leave the regulator plenty of voltage to operate properly. The RS-3 sound board has a bridge rectifier at its input and normally it wouldn't be acceptable to jumper an input lead and the internal system ground (battery negative). However, in this case it works out OK. If you follow the circuit, diode D4 is shorted out by the external wiring. Because the input voltage is now unipolar, diodes D2 and D3 are always reverse biased and do nothing. Diode D1 is always forward biased which allows the input current to flow into the sound board. If you will run with DCC only, you can dispense with the battery altogether and this arrangement will work fine. With PWC, the battery isn't entirely necessary although there will be no run on sound at zero track voltage. If you slow the engine to a stop without running the track voltage to zero, you can still keep the idle sound going. If you do come to a dead stop, the engine startup sound will trigger every time you start it moving again. With linear power, the battery is necessary for the system to operate at all at slow speeds. I mounted the PH booster board right above the battery with a little hot glue, it just fit. The large inductor that is normally wedged next to the battery is gone, it is no longer necessary. I used the empty space to stuff extra wire. The bridge rectifier and optoisolator were stuck to the side of the housing with a little hot glue. Installation of DCC in the newer RS-3 is much easier, at least for the motors. There is a jumper plug on the distribution board inside the long hood that is intended to be replaced by a command receiver or decoder so isolating the motor is easy. All that needs to be done is to cut the red and black wires in the middle and then wire the pair labeled "power" to the decoder red and black leads. The leads marked "motors" go to the decoder orange and gray leads. In this case, the motor switch is still in the circuit so that the hoods have to be plugged in for the engine to run. If you want to allow the engine to run with the hoods unplugged, then short out the blue and black wires at the connector on the frame. This makes the engine think that the hoods are connected and that the motor switch is on. The installation in the newer RS-3 is neater than the older one, partly because of the layout of the newer one and partly because I just did a better job this time. The modified constant voltage regulator is mounted on the frame at the front of the engine. 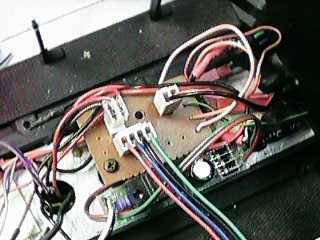 To facilitate removal of the hood assembly from the frame, the voltage regulator and the headlight wiring are run through Molex 0.062 type connectors. These are available at most electronics stores in various pin counts. A 5 pin connector is necessary for the lighting, a 3 pin would work for the regulator, but I used a 4 pin as I didn't have a 3 pin version handy. Note that when the regulator is bolted to the weight, the weight be comes electrically connected to the "ground" terminal of the regulator. Be sure that nothing else is electrically connected to the weight. Lighting is done the same way as the older RS-3. The cab and marker lights are left alone. The LED headlights are scrapped and replaced with Grain of Wheat bulbs that run directly from the decoder. This is the schematic of the DCC installation in the newer RS-3. I've added the sound triggers to the schematic as if a PH Hobbies sound system was installed. I've also shown the changes to the constant voltage regulator circuit that were needed to get the smoke to work on my unit. If your smoke works now, don't mess with it. My initial DCC installations in the RS-3's used Digitrax DG580L decoders. I chose these because they had an adequate current rating and they were loaded with accessory features. Further, they were less expensive than other high current decoders. However, all was not well. These decoders do not appear to be able to handle as high a current as advertised. You might note that in some of the photos above, the white shrink wrap around the decoders has melted and split due to excessive heating. The decoder in the older unit started to shut down at odd intervals and became unusable after awhile. It ran so hot that I couldn't touch it, even with a fairly short train. The decoder in the new RS-3 just died while I was trying to start a heavy train. Digitrax eventually repaired or replaced both decoders at no charge, but I elected not to reinstall them in these engines because it was obvious to me that the decoders weren't up to the load. Instead, I put them into smaller locos that draw less current. Instead, I purchased a pair of NCE D408 decoders. These units don't have the rich accessory set of the Digitrax units, but at least they ran. I really tried to beat them up, but they hardly get warm. Under the same load that killed one of the Digitrax decoders in about 5 seconds, the NCE decoders just run on and on. I have recently installed a Dallee Electronics diesel sound system in the new RS-3. The Dallee system is inexpensive (<$100) but the sound quality of this particular unit is marginal at best. I even tried it though a stereo speaker and it still sounded tinny, distorted and lacked gut. The problem is the particular recording in the "new" Alco ROM. It just doesn't sound very good. Loy's Toys changed out the ROM for me to an older version and that one sounds MUCH better. The system is designed to integrate well with DCC decoders and it coordinates the engine runup sounds well. The bell will only run up to notch #2 and runs along with the engine sound. The horn overrides the engine sound, but it really doesn't matter because the horn is so much louder than the engine that you couldn't hear the engine anyway. Since the Dallee sound system is optimized for DCC, installation was pretty easy. The system is attached with double back tape to the bottom of the frame inside the tank. Mounted this way, the volume control is essentially inaccessible, but the tank can be removed and the engine run if it necessary to adjust the controls while operating. I used some extra sound system cables to connect to the sound system connectors on the bottom of the RS-3 for the power and speaker connections. 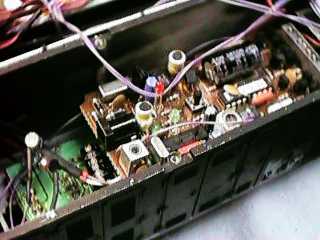 The motor connection wires were run up the slot next to the existing connectors and soldered to the motor connections on the main circuit board. Function wires were run back down the same slot to active the bell, horn, prime mover ramp up and sound system enable connections as shown in the Dallee documentation. The only change that I made involved the sound system disable where I followed Loy's Toy's recommendations using the extra parts that Loy's Toy's provided. The PH sound system will shut down after 30 seconds or so of no motor voltage. Without the disable option connected to the decoder, the Dallee system will continue to idle as long as there is track power so if you want to shut up, you have to make special provisions. I had another problem with the Dallee that I found annoying. It would blow the horn for no obvious reason at random times. I first suspected an interface problem between the Dallee and the NCE decoder, but the steam system that I put in the Aristo 0-4-0 started doing the same thing and it uses a Digitrax decoder. To solve this problem I installed an optoisolator and the problem went away. The bell didn't have the same problem, but if it starts to flake out, I'll isolate it too. The Dallee system does not have its own battery, so it won't work very well with regular or PWC track power as it'll shut off at moderate track voltage. It can run off the main battery of a battery powered system. There is no automatic sound sequence played when a trigger is activated so it won't work well with track magnets and reed switches. You need to control the duration of the bell and horn sounds through DCC decoder or R/C receiver functions. The RS-3 is straight forward to disassemble and reassemble, but there are lots of screws and it does take some time. See Aristo Brick Tune-up for a description of how to disassemble and reassemble the trucks. Aristo Craft has posted exploded diagrams of the RS-3 at Exploded Diagrams. They are .PDF files so that you need Adobe Acrobat Reader to read them, but there is also a link on the exploded diagrams page to get a free copy of Acrobat Reader. These diagrams are extremely useful and I would recommend that you download the diagram, print a hard copy and study it before you take your RS-3 apart for the first time. Also note that if you have a new RS-3, the long hood, cab and short hood must be removed as a unit. Remove the fuel tank by removing the four screws that mount it. The long hood mounts with eight screws. Remove the screws and the hood should come off with a little coaxing as it fits tightly. Reassemble in the reverse order. Be careful to reinstall the cable leading the switches or your engine will not run. The short hood and cab mounts with 9 screws. There are 6 screws under the short hood itself, two under the battery boxes and one under the center of the cab right at the rear of the cab. The short hood and cab come off as a unit but can be separated if necessary. Be careful when you pull off the hood as there is a cable leading from a circuit board on the frame to the board that mounts the headlights. Since the RS-3 was first introduced in 1997, four distinct versions have been produced, each with incremental cosmetic, mechanical and electrical improvements to the previous version. I refer to these as "generations." The 1st Generation of the RS-3 was the first Aristo model that incorporated a fine level of detail. This version was mechanically and electrically similar to Aristo diesels that had been produced for about 10 years. It used the friction bearing power bricks with lash screws at the ends of the motor shafts. The 2nd Generation RS-3 is mechanically similar to the 1st Generation, but it has all new wiring. This is the "new" version described above. The bricks plug into main circuit board from the bottom so that brick removal is significantly easier. The bricks themselves still had friction bearings, but the lash screws were gone. Also, in each axle bushing, there is a spring loaded contact that rides on the end of the axles. The wiring was all new with a 6 VDC DC-DC converter to power the lights and smoke unit. 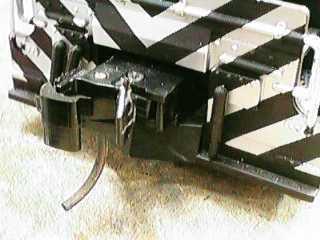 There are connectors for a sound system mounted on the frame inside the fuel tank. Externally, it was very similar to the 1st Generation unit. The most easily detected external feature difference was that the cover to the switch compartment had small lips molded into it to allow it to be more easily removed. The 3rd Generation RS-3 had some significant mechanical changes. The bricks were all new with ball bearing pickups and new wheels made of a material that don't require as much maintenance. The sideframes were no longer a part of the support structure of the locomotive, they were cosmetic only. 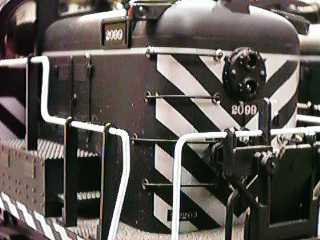 Sometime about the introduction of the 3rd Generation, connectors were added at both ends to allow easier connection to a battery trail car. The 4th Generation RS-3 incorporates the new internal wiring features that allow a plug in DCC decoder or R/C receiver. It has a new smoke unit, and new external detail such as a metal etched fan screen.